For those who intend to choose an Intex 15 x 48 pool for your family, there are two options for you. The first is from Easy set pool set line, and the latter is from Intex metal frame pool set line. Each comes with pros and cons. Also, the prices are also different. The first model that comes in 15-feet x 48-inch size belongs to Intex Easy set pool set line. As its sibling, the pool walls are made of laminated PVC that is tough and durable. Generally, the wall is quite hard to be punctured by something. And then, the entire wall comes with blue shade and an imprinted “Intex easy pool” on it. In terms of convenience, it is designed with a smart drain plug that connects to a garden hose so water can be drained away from pool or house area. In addition to this feature, it has new dual suction outlet fittings. These features are designed to improve water circulation so that your maintaining water hygiene and clarity are done better. For the brim of the pool, it comes with top ring that needs to be inflated before pumping water in. Especially; the pool is equipped with the Ground Fault Interrupter that helps shut off the pump if electrical current is exposed to water. Therefore, it adds safety feature to the pool. Any additional items are included with the pool? When purchasing, you also get many necessary items for your pool including: Krystal Clear Cartridge Filter pump, 1,000 gph (110-120V), ladder, ground cloth, debris cover and Set-up and maintenance DVD. The second pool whose size comes in 15ft x 48 inches is from Intex metal frame pool set. Similar to other sizes in this line, the pool is made of laminated sidewalls reinforced with an all-around band to keep frame legs firmly in Place. The metal material makes the pool sturdier and tougher. Generally, it is strong enough to for kids hop over the side. Or, it allows kids to hand and sit on it without collapse. In addition, the pool is also designed with new dual suction outlet fittings to improve water circulation, so that, you can maintain the hygiene and clarity of water better. Conveniently, the design is equipped with unique drain plug that connects to a garden hose so water can be drained away from pool or house area. Especially, Intex always offers additional items for every pool. And, this model will include Krystal clear cartridge filter pump 1, 000 GPH (110 – 120V), ladder, ground cloth, debris cover and instructional DVD. All of these items are necessary and helpful for your installing, maintaining and enjoying your pool. About the design – there are several features that Intex 15ft X 48in Easy Set Pool Set and Intex 15ft X 48in Metal Frame Pool Set share each other. One is the drain plug that connects to a garden for convenient draining. The second similarity is the design of dual suction outlet fittings for better hygiene and clarity. About The Included Items – Though most of Intex above ground pools come with included items for every purchasing of pools, the items are added a bit different. However, the above models mentioned in this Intex 15 x 48 pool review include the same items. They consist of Krystal clear cartridge filter pump 1, 000 GPH (110 – 120V), ladder, ground cloth, debris cover and instructional DVD. About the wall – Intex 15ft X 48in Easy Set Pool Set is made of laminated PVC, meanwhile, Intex 15ft X 48in Metal Frame Pool Set is constructed from laminated sidewalls reinforced with an all-around band to keep frame legs firmly in place. 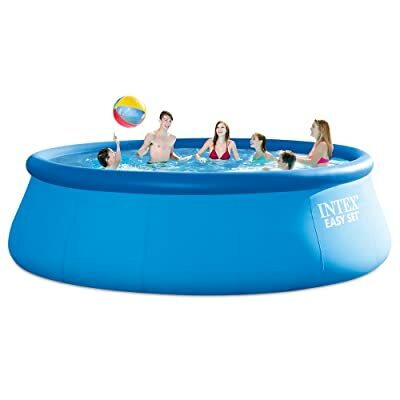 About the diameter – though they are claimed 15 feet in diameter and 48 inches in depth, the unique shape of Intex Easy set pool creates two different diameters. The diameter of the top is smaller than the bottom of the pool, whereas, the Intex Metal frame pool has vertical wall that makes the same diameter from top to bottom. About the downsides caused by the unique design – for the Intex easy pool set, it is designed with top ring that needs to be inflated before filling the water. That means the pool can’t stand up by itself. It gets its shape after holding water. There is also a downside coming from this unique design that needs your special care. I mean the inflated brim is more likely to be deflated by itself. Even, they are easy to be punctured by pointy objects, and scratched by pets. In addition to these, the ring is also more likely to shortly dry out and become brittle in the extreme sun. Along with that, the diameter of the top is smaller than the bottom. This leads to less amount of water held in the pool as compared to Intex 15ft X 48in Metal Frame Pool Set. For the Intex metal frame pool set, the construction is built from vertically laminated sidewalls that can allow the pool to stay upright by itself. And also, it can hold more water as compared to its competitor. There are differences in price when it comes to shopping Intex 15ft x 48in above ground pools. The model that comes from Intex Easy set line is more affordable than the one coming from Intex metal frame pool set line. So, if you are more into friendly-budget option, the Intex 15ft X 48in Easy Set Pool Set is a great one to pick up. How many people that an Intex 15ft X 48in above ground pool can fit comfortably? How about the water capacity of an Intex 15ft X 48in above ground pool? 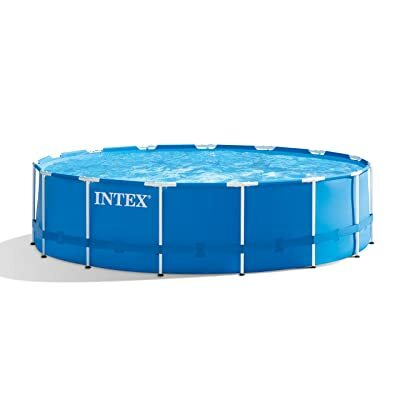 For Intex 15ft X 48in Easy Set Pool, it needs 3,736 gallons of water for 80% of the pool, whereas, it needs 4, 440 gallons of water for an Intex 15ft X 48in Metal Frame Pool, and this water capacity is equivalent to 90% level of the pool. Is it necessary to place the pool on the level ground? As Intex advises the customers, the Intex above ground pools need clearly level ground to be installed, but as some feedbacks left by Intex’s customers, it is alright to place the pool on a bit lopsided or on an uneven ground. However, the super even ground is always better. Hopefully, the Intex pool 15 x 48 reviews are enough informative, and helpful for you. Also, the information are divided into different categories will help you easier to compare and evaluate each pool by yourself, and then you can be easy to make your purchasing decision.